Yes, Liverpool have once more turned a corner in a bid to arrive at a destination of some kind, presumably. With more twists and turns than the labyrinth, Liverpool’s season hasn’t got off to the best start. But with their last minute goal against Arsenal, and another 1 point claimed at home, Brendan Rogers has continued in his trend of describing every Liverpool game as a “turning point”. Leading British betting sites now have Liverpool odds on to reach the Triwizard’s cup should they turn yet another corner (they will also have The False Nine up against the court for crimes against Jokesmithery if they allow another Harry Potter joke to be published on their football website. You definitely could’ve said a Minotaur). Recognise those lyrics? I do. I was about 12 years old and my mum actually let me take my Playstation 2 with me when we went to the coast with a family friend for a weekend. Safe to say I drilled the game over that week, being the sociable pre-teen that I was, completing it to the soundtrack of the Country and Western radio station K-Rose, where I heard and sung along to that song more times than I care to admit. Sadly for Liverpool fans, it seems that paragon Brendan Rodgers finally lost his grip on reality. A giddy mess at the end of last season, Rodgers’ “couldn’t believe his luck” attitude quickly evaporated as the team got off to a bad start in the 2014/15 season. With an ever increasing run of bad results, Rodgers’ traditional gritty realism has been replaced with a dejected, fancicful spool. Most recently Rogers began discussing folklore at a press conference then reportedly ran off into the woods and hasn’t been seen since. Fingers crossed he gets back in time for Sunday’s United game, as it looks like they’ll be needing all kinds of fairytale luck to get anything from that. Coming out of Tsurugaoka station you could hear the chanting already. 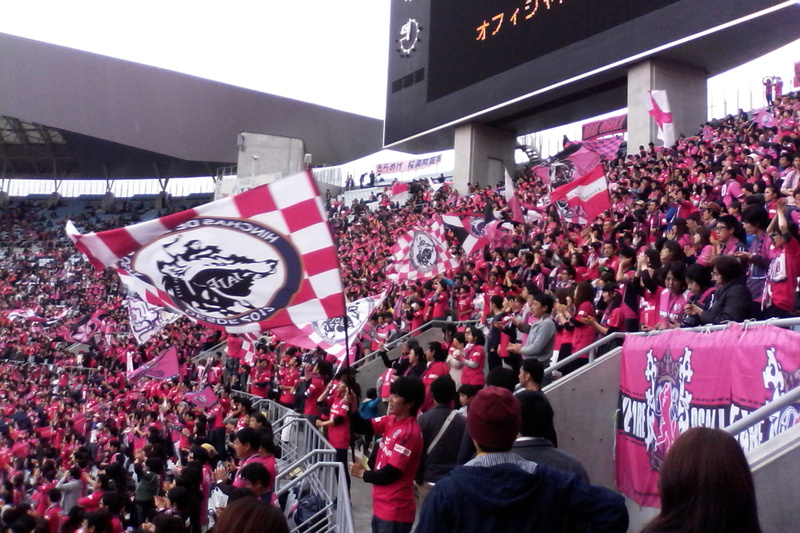 It was an hour before kickoff, but the Cerezo Osaka Ultras were already whipping up the crowd. It was so loud I started worrying the game had started and I’d got my times wrong in my hungover state induced by all you can drink Karaoke (yeah that’s as dangerous as it sounds) the night before.